Springtime is an ideal time to address nuisance deer in your gardens and back yards. There are many compelling reasons for starting early with deterrence. Deer are habitual in their feeding habits, and once they’ve developed a feeding pattern that includes your yard, it may be tough to change that habit. Loss and damage to vegetation is a good reason to prevent deer from feeding on your property. Avoidance of tick-borne diseases, including Lyme disease, is an important consideration where it is emergent. Lyme disease is bacterial infection that afflicts people and pets. It can be treated with antibiotics if diagnosed early, but some people suffer long-term effects with painful symptoms. The disease is concentrated in the Northeast and parts of the upper Midwest, but cases have been reported in nearly every state in the lower 48. Ticks cannot jump but move via direct contact from deer and rodents to grasses and other vegetation. By limiting the contact with deer, one can lower the chances of coming into contact with a Lyme-infected tick. 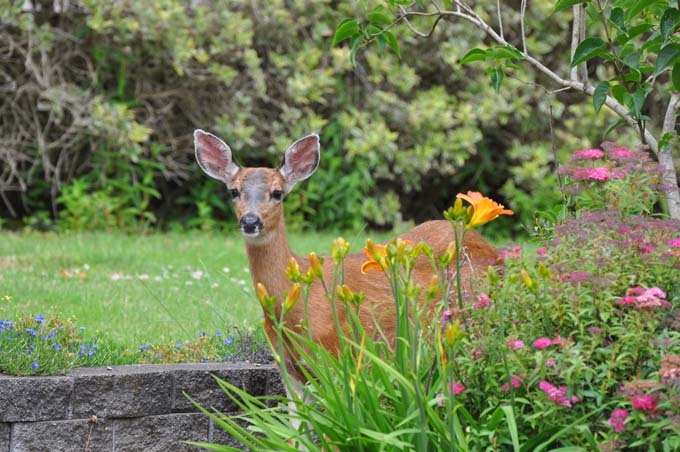 There are a number of strategies to reduce the interaction with deer and discourage damage to landscaping and gardens. Native plants, especially ones that are unappealing to deer, can not only keep deer damage down, but add low-maintenance beauty to your yard. Work with your local university agriculture extension or garden center to identify native species to incorporate into your gardens. This approach can be two-pronged. Just like any human, deer have plants that they like to eat and those that they don’t. Identifying plants that may be unpalatable or taste bitter can be one way to keep your gardens intact. One thing to keep in mind, deer may change their eating habits if they eat a bad tasting plant and suffer no ill effects in the digestion. This plays out in especially hard winters where normal food stores in the wild are depleted and deer are starving. It can make sense to create feeding areas in the woods away from your yard using tasty tree and shrub trimmings that deer can feed from over winter. So using a taste deterrent may work for a while, but may only protect for as long as the deer decide not to eat it. There are many sources for deer taste deterrents that are harmless to plants and can keep deer from eating them. Some are commercially marketed, and others can be made at home with ingredients like milk, eggs, and soap. Other deterrents involve activating a smell repellent. Deer don’t like strong scents, and may be deterred by scents as disparate as Irish Spring bar soap or dried animal blood or urine. If using a repellent on vegetable or fruit plants destined for your table, you’ll want to ensure that the deterrents you apply won’t adversely affect your produce. Another interesting deterrent is collecting unwashed hair cuttings from a local barbershop or salon and hanging them in nylon stockings around the perimeter of the area you wish to protect. 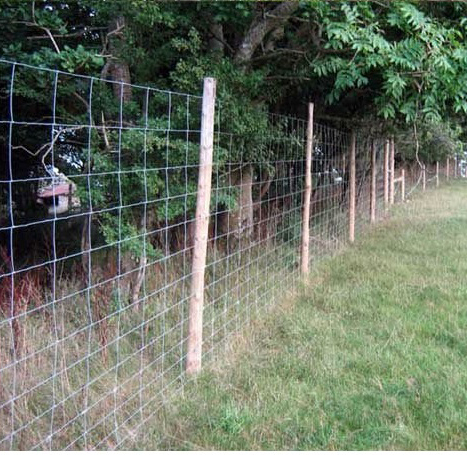 Fencing, both permanent and temporary can be a highly effective deterrent for deer. In some areas, temporary deer fencing can be put around areas you need to protect from deer until other natural feed sources leaf out. A more permanent fence may not only keep deer out, but also enhance your garden and landscape. If it’s a large vegetable garden that needs protection, some serious gardeners invest in a temporary electrical fence installation. This can be a highly effective deterrent for deer and other destructive critters that can clean out a crop of carrots in one night. We located some good resources on controlling deer below. Check in with your state wildlife resource department for more localized information.